Each 5 ml contains 300 mg Magnesium Hydroxide BP and 1.25 ml liquid paraffin BP. 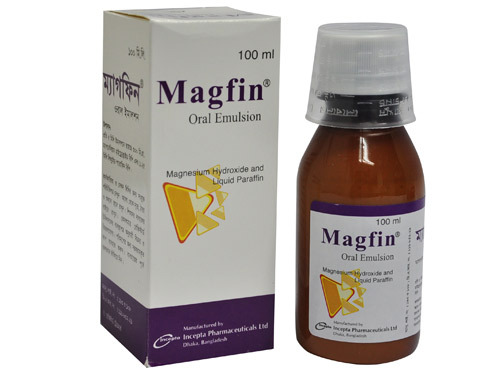 Magfin has a dual-relief formulation containing a gentle laxative ingredient and a lubricant which eases the discomfort associated with straining and bowel movement. It is recommended for the temporary relief of constipation. 15-30ml before breakfast or at bedtime. Over 7 years: 7.5ml-15ml at bedtime. 3-7 years: 5-10ml at bedtime. The dose may be mixed with milk or half a glass of water if desired. Note: Don't take for more than 1 week unless under doctor's supervision. Rectal irritation, potassium loss (thirst, weakness,nausea and diarrhea). Renal and hepatic impairment. Maintain adequate fluid intake. Can be given to pregnant and lactating mother.